I visited New York in 2009 for the first time when my friend Priya moved there and it was love at first sight. For some inexplicable reason I m in love with this place. Since then I ve been a few more times and that feeling just intensifies with every visit. Maybe having a very dear friend there made it easier to love the place. My crashing at her pad at sometimes inopportune moments and Priya’s hospitality at such times make her an awesome host and add to my New York experience. The city, its energy and modernity resonates with my soul. The heady mix of Museums, Theatre, Food, Music, Parks, Fashion, Shopping and just living in this place for a few days is a rejuvenating experience for me. One small bite of this Big Apple has you hooked. This year I even celebrated my 40th Birthday with a trip to New York with my dearest girlfriends. But I’m still not done with this city. I try to maximise my days in New York with a mix of catching up with friends, Shopping jaunts, a quick breather in one of the many parks, a couple of visits to the Museums, checking out some of the famous Eateries (trying a new cuisine) and taking pictures. A quick pit stop to Sephora is a must do. I like to explore all my senses when in this city. Isn’t that what a holiday is about ? 1. Park Culture – New York city has the biggest and best park I’ve ever seen right in the middle of the city which is Central Park.The city is interspersed with parks all across giving it that much needed greenery in the midst of the sky scrapers. There is The Highline, Bryant Park, Washington Square Park, Madison Square Park Conservancy, Riverside Park and more. Each park is well maintained and it gives one such a sense of peace.Most of these parks allow you to do so many different activities. In summer you can take a Yoga class in the Park, have a picnic, go biking, grab a coffee at the café, watch the little remote controlled boats in the little pond. In winter you can even ice skate in the park. 2. Diversity – One of New York City’s greatest attributes is its Diversity. Not just America’s Melting Pot, its a Global Melting Pot. With more languages being spoke than you’ve every known. 36% of the people in New York are from other countries. Its a mix of Natives, Immigrants and Visitors. A great example of America being the land of Opportunity. For New Yorkers, its exposure and education of the world right there at their doorstep thanks to this diversity. 3. Art – Whether you love Modern Art or you are a connoisseur of Fine Art, you can find it here in New York City. Most noteworthy of the museums are – Modern Art at MOMA, Impressionist art at the Guggenheim, Works of art, architecture and sculptures at The Met, American Art at The Whitney, German and Austrian Art at The Neue Galerie to the largest museum in the world, The American Museum of Natural History with millions of specimens of plants, fossils, animals, rocks and more. There is something for everyone who likes art in any form. 4. The Skyline – Once the sun sets and the light comes on, that’s when my heart beats for New York. I love looking up to the Chrysler Building all lit up, I like to know what colours the empire state building is going bathed in. The twinkling lights of the Brooklyn bridge. the views from The Standard Highline, The crazy lights at Times Square. The best way to enjoy the views are from all those roof top bars and restaurants. 5. Food – Around every corner in every street you will find an eatery. You could go out at any time of the day or night wanting almost any kind of food from around the world and chances are you would find it. With people from all over the world living here or visiting,it is a melting pot of taste. Its in New York, that I discovered my international palate, thanks to my friend Priya who pushed me to try different cuisines. As a result I have tasted Ethiopian food on Bleecker Street, Falafels at Mamoun’s Falafel, Venezulean food at a South American Restaurant in the East Village, Thai food at Jaya Thai, Chinese in Chinatown, Japanese at Nobu and Sushi Yasuda, Ramen at Ippudo Ramen and Korean Food with another friend Gayatri. Don’t miss a visit to a roof top bar or brunch on the weekends. And definitely try and go to a speak easy if you can. 6. Theatres – If you like theatre, well this is where you ought to be. New York City has the most number of theatres ever. You can watch movie that’s just come, you can visit all the Film festivals that come by and that movie you’ve been dying to catch. As for Broadway – its mesmerising, the shows unbelievable and there is always something for everyone. Kids, Young lovers and the older crowd. With Broadway, Off Broadway, Off Off Broadway and events like The New York Musical theatre festival there is no dearth of variety and choice. 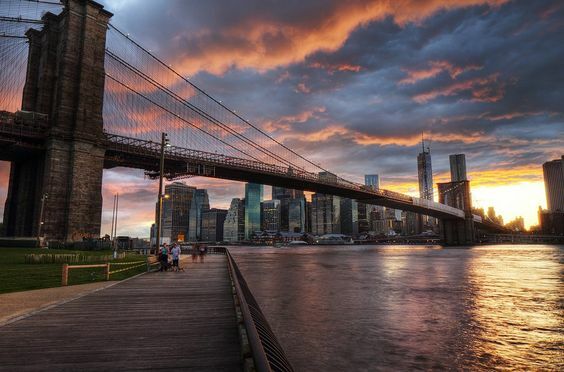 Seems like no one can ever be bored in New York city with so much to do, see and go to. 7. The Landmarks – Brooklyn Bridge, Empire state building, Statue of Liberty, Central Park, Chrysler building, The Met, Rockefeller Centre, Top of the Rock, One World Trade Centre Building. Williamsburg Bridge, Hell even Macy’s. Need I say more. 8. Brooklyn – For the very unique vibe it has, for its culture, for the Brooklyn Botanical Garden, the Brooklyn Museum, its brownstones. For the Brooklyn Book festival and Coney Island. 8. Soho – Soho is for aimless loafing, window shopping and checking out all the eateries. There are some popular restaurants here like Balthazar,Jack’s wife Freda, The Dutch,La Esquina and many more. 9. Shopping – Needless to say the Best Fashion brands are right here in Manhattan with the latest in Fashion. New York Fashion Week brings all the street style stars, Real stars, Fashion Bloggers, Stylists, Magazine Editors and other fashion mavens to the streets giving us a live fashion show. If you want the best, you get right here. Plus you have the outlet malls in New York and New Jersey to get your fashion at a cheaper price point. My favorite pastime is to walk down 5th Avenue window shopping and taking it all in. 10. The Manhattan Grid – The way Manhattan has been designed with avenues and streets. As a result it is easy to get around in Manhattan. The energy, the vibe, the pace of this city recharges my batteries and that is why I love New York.